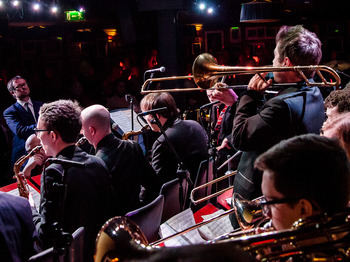 In collaboration with NYMAZ and their Connect:Resound project, the National Youth Jazz Orchestra will live stream a concert to schools and army bases across the UK on June 6th. For full information, visit the NYJO website. On Tuesday 6 June at 11.10am children across the country will experience a jazz performance like no other: a live show from the National Youth Jazz Orchestra (NYJO) will be broadcast over the internet to UK schools and to British Army bases worldwide. It will be an unforgettable opportunity to hear – and see! -– twenty-three of the finest young jazz musicians in Britain, directed by trumpeter Mark Armstrong. The broadcast is part of Connect: Resound, a project led by youth music development charity NYMAZ, to explore how technology can provide more musical opportunities for children and young people living in remote areas. This exciting event is presented by Swaledale Festival and will be broadcast live from Risedale Sports and Community College, with 500 pupils from the College and local primary schools in the audience. Technology specialists UCan Play and the British Forces Broadcasting Service will be ensuring the broadcast reaches the eyes and ears of children across the world via the internet.